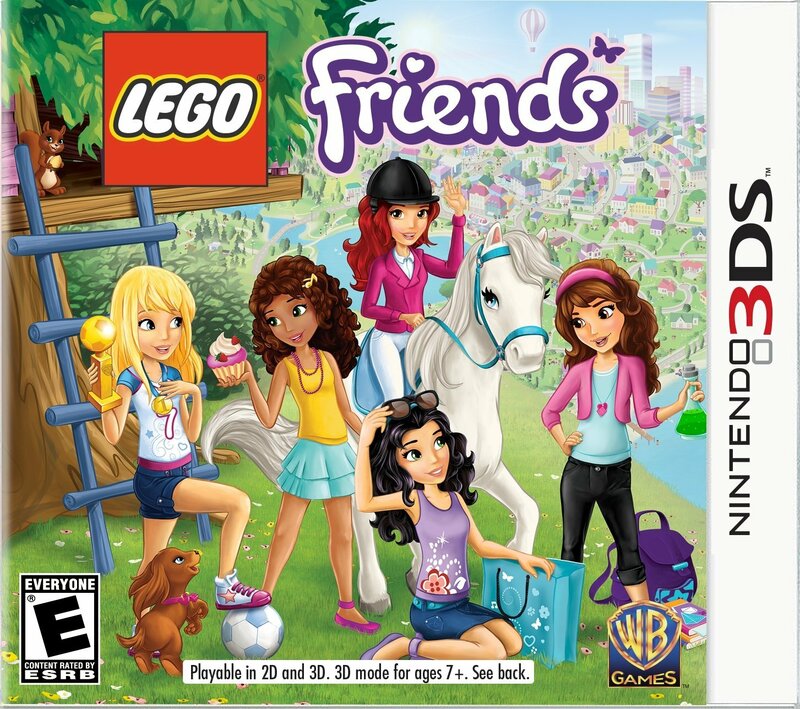 Amazon currently has the LEGO Friends for Nintendo 3DS handheld game console on sale for $29.96, a 25% discount off of the regular price of $39.99. Based on the game trailer, it doesn’t seem to be doing much to break the gender stereotypes that the Friends line is infamous for, and in fact probably perpetuates them more than anything. There aren’t any reviews online yet that I could find, and it’s not surprising considering the game and the market it’s aimed for. Not to say that girls don’t play video games, but that it is a smaller market and plus it’s based on a niche product line. The game play doesn’t seem to be very deep. The game feels like a collection of mini games you traverse your way through. In any case, take a look for yourself and decide if the game is even worth picking up. Amazon is applying a pretty nice discount to the recently released 41015 Dolphin Cruiser. It is 20% off of MSRP at $55.99, down from $69.99 MSRP. Get it while the gettin’s good! And finally, from last week’s post, 3315 Olivia’s House is still 21% off at $59.31 and 3184 Adventure Camper is down 23% off at $27.09. 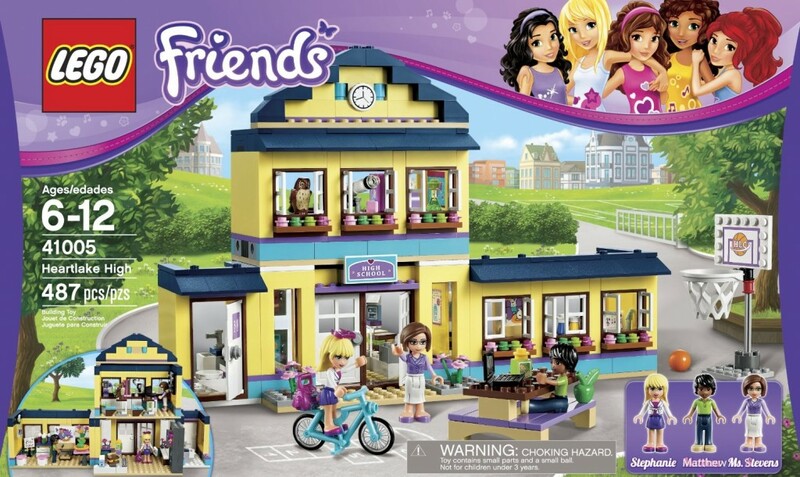 Amazon is discounting a handful of LEGO Friends sets, all at least 20% off. The sets are a bit older, but it would be a good time to fill the holes in your collection before they’re retired and harder to find. 3184 Adventure Camper is discounted to $27.09, down 23% from $34.99 MSRP. 3315 Olivia’s House is discounted to $59.31, down 21% from $74.99 MSRP. 3061 City Park Cafe is discounted to $27.52, down 21% from $34.99 MSRP. And finally, 3188 Heartlake Vet is discounted to $36.10, down 20% from $44.99 MSRP. 3315 Olivia’s House is one of the few Friends sets that has a male minidoll, and it was the ONLY set to have a male minidoll before 41005 Heartlake High and 41015 Dolphin Cruiser came out. 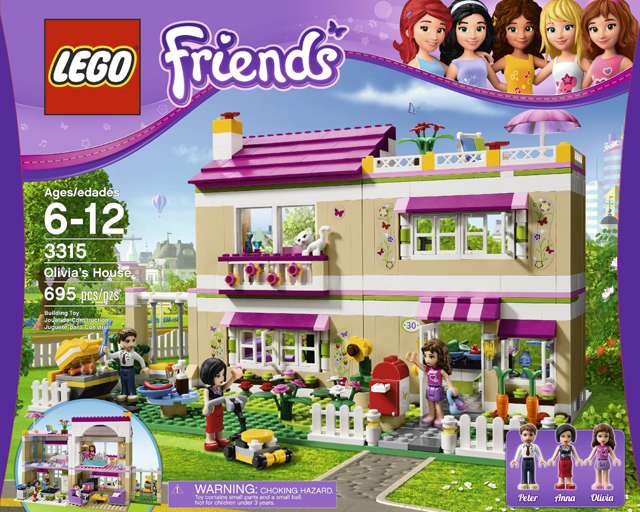 Amazon and Target are putting some pretty nice discounts on LEGO Friends sets, anywhere from 20-32% off. There are a handful of sets that are cheaper on Target but I imagine that Amazon will match their sale price sooner or later; I’ve linked to both just in case. If you’re a REDCard member and live in one of the handful of states where Amazon charges sales tax, you’ll probably wanna hit Target as you’ll save an additional 5% and score free shipping as well. I won’t list every set on sale, instead just list some of the highlights. 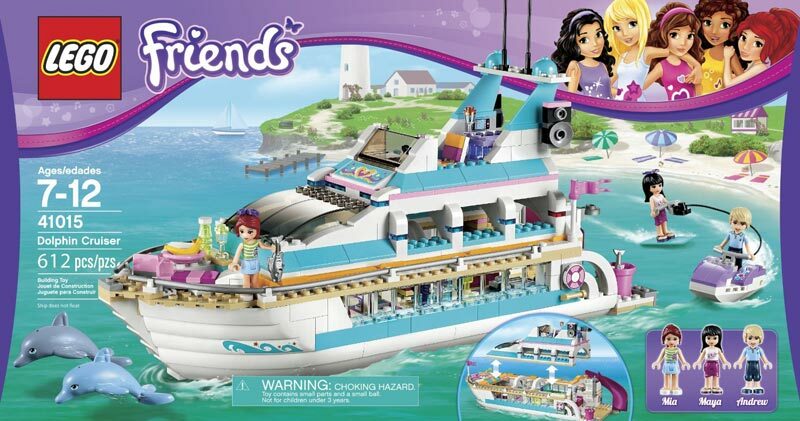 Of particular interest are the two biggest sets from the fall assortment of Friends: 41015 Dolphin Cruiser and 41005 Heartlake High are both 20% off. 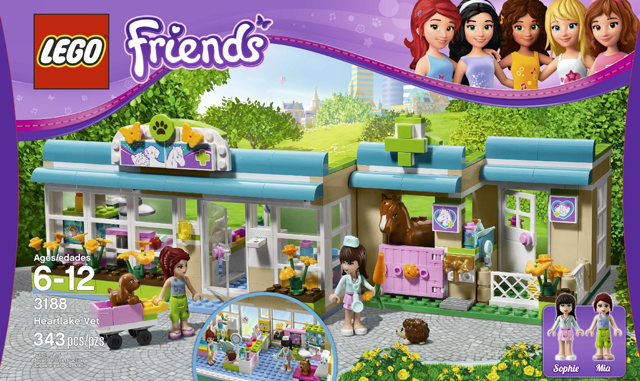 You can check out Target’s search results for LEGO Friends or Amazon’s results to get more of a complete listing. Right now, Amazon.com has 3315 Olivia’s House discounted by 21%. Regularly priced at $74.99, you can buy this set for only $59.39! This is a great deal on a great set and currently the only set that has a male mini-doll. There are more male mini-dolls coming in the fall though, so Olivia’s dad won’t be totally alone in the boys’ club. Amazon also has a few other sets seemingly on permanent discount. 3184 Adventure Camper is $29.00, normally $34.99. And 3188 Heartlake Vet is $38.00, discounted $44.99. They’re all priced $4.99 and come with about 30+ pieces or so. Our daughter’s favorite is the Squirrel’s Tree House set. Series 2 is right around the corner with a projected street date of May. I must have missed this the other day when I was browsing Amazon for Friends sets on sale, but better late than never, right? Amazon has 3188 Heartlake Vet on sale for almost 15% off MSRP of $44.99. It’s now only $38.73 and qualifies for Free Super Saver Shipping. You get 343 pieces, minidolls Sophie and Mia, and is the cheapest set that comes with the hedgehog. I just found this after posting my last post and while poking around Amazon, but they put another Friends set on sale. 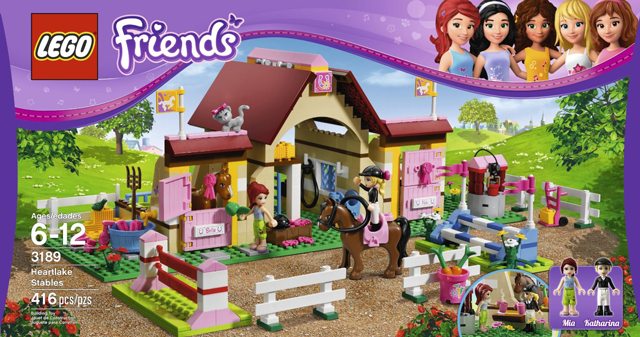 3189 Heartlake Stables is discounted 32%! It’s now only $34.00, regularly priced at $49.99. This, along with the Adventure Camper set, they make for a pretty nice play scene. We all know LEGO is expensive, so when a sale comes along, you’re probably like me and buy like crazy. 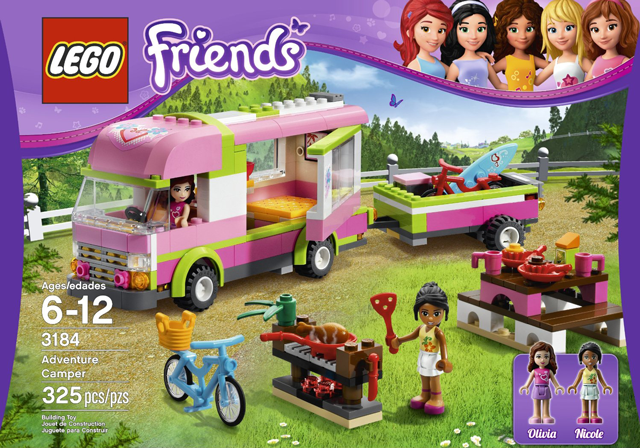 Amazon put LEGO Friends 3184 Adventure Camper on sale at almost 30% off. It’s only $25.00! And it ships for free with Super Saver Shipping! Keep your eyes peeled! One of the new polybags for 2013 has already been found. I found the new set at my local Target hanging on the pegs in the Friends section. Reader ninnymuggins reports finding his in the seasonal section. Price was $4.99.